Here's a cover many of you won't have seen before, except as a reduced B&W image in some ads in BUSTER and WHIZZER & CHIPS comic libraries back in the mid-'80s; or for the first time in colour over at this link. 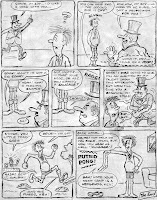 Click on now for loads of fascinating facts and features about ANDY CAPP's wayward offspring. FRIGHTENING LIGHTNING STRIKES - AGAIN! 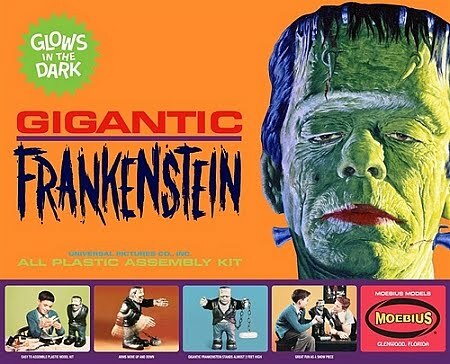 Following on from their re-release of AURORA's BIG FRANKIE kit a year or so ago, MOEBIUS have also released a GLOW-IN-THE-DARK version of the same kit. The original model was only available or a period of about a year back in the '60s before being withdrawn, and was never issued as a luminous kit. Moebius have now rectified this situation, so get your hands on this kit before it sells out - if it hasn't already. See details below. 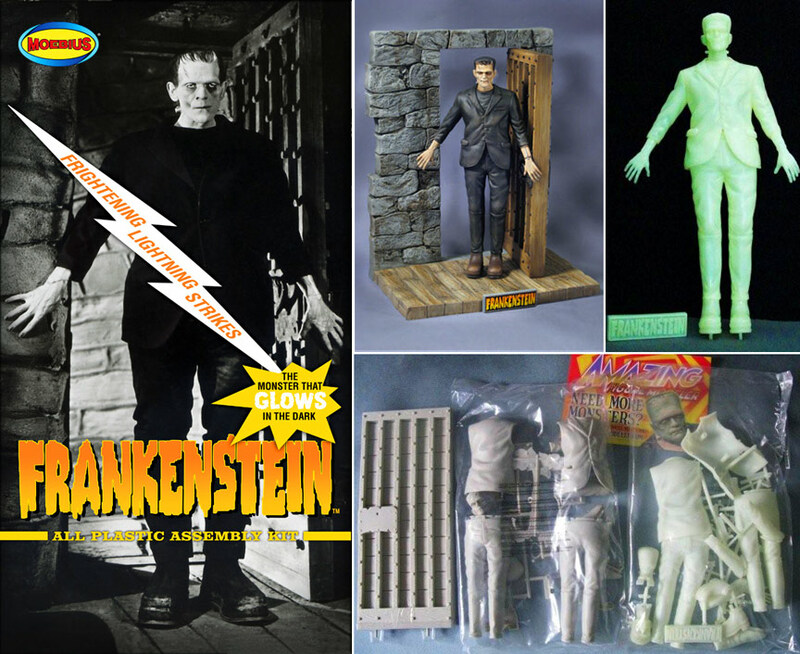 What a fantastic looking new model - a scene straight from the 1931 UNIVERSAL PICTURES movie - FRANKENSTEIN. Moebius are doing some terrific models, including rereleasing various Aurora models with their original box artwork. Details can be found at http://www.moebiusmodels.com/ - check it out. "Kid - I want you - now!" 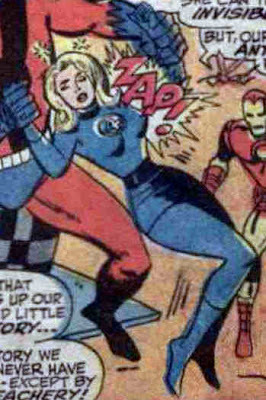 JESSICA ALBA as SUE STORM - thankfully not invisible in this pic. Look at my face in the above photograph - you're right - I can't believe my luck! A real, live, pretty girl - and I've got my arm around her. Look - you can see I've almost fainted from the shock. Unfortunately, I wasn't allowed to take her home as she was a friend of the person who took the photograph - but I put "real, live, pretty girl" at the top of my Christmas list to Santa that year. 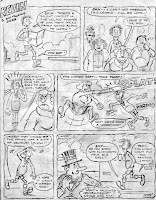 Sometime back in February or March of 1985, BOB PAYNTER, group editor of IPC's humour division, asked me if I might have any ideas for a new comic which was in development. "It's going to be like VIZ, but not quite as rude!" he informed me. As far as I remember, the comic was an 'out-of-house' production being developed in Manchester (I think - could have been Birmingham) and IPC were only going to print and distribute it through their usual channels. I turned my mighty brain to the task and soon came up with a daft idea for someone who owned a pair of talking socks. At first I was going to call him TREVOR, being slightly more alliterative, but decided instead to name him after KEVIN BRIGHTON, one of the IPC art assistants, who worked at the desk next to mine on the 26th floor of KING'S REACH TOWER. 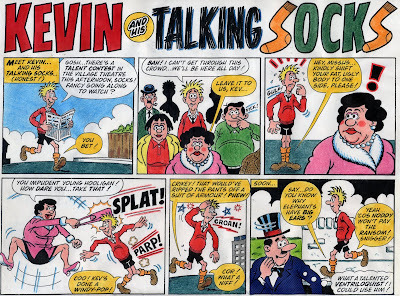 I was living in Southsea at the time, and I recall as if it were only yesterday, sitting in the cafe on the top floor of Portsmouth's central library, working on the rough of the first (and - so far - only) episode of KEVIN & His TALKING SOCKS. I duly handed it in to Bob, who sent it off to the OINK boys (for that was the very comic being developed) for consideration. Some weeks later I asked Bob if he'd had any response, but he hadn't, so we assumed that my strip hadn't found favour and promptly forgot about it. Several months later, however, I decided to draw up the finished strip - just for my own satisfaction. Below is a scan of the photocopies I made of the original roughs before giving them to Bob to send on (which were never returned), and which I used as a guide when I drew up the finished page. 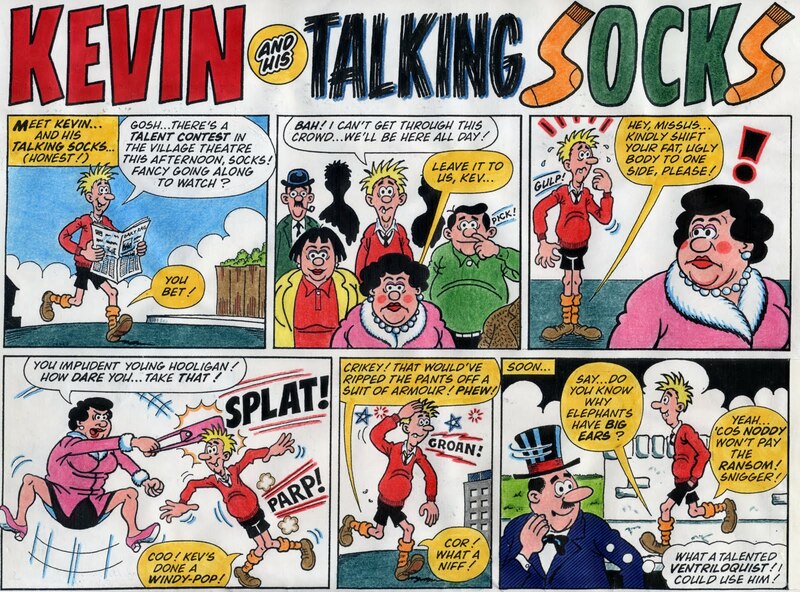 Interestingly, some time after OINK hit the stands, a new strip appeared called HECTOR VECTOR & His TALKING T-SHIRT. Coincidence? Subliminal influence? Rip-off? Don't suppose I'll ever really know, but it certainly gives me pause for thought. 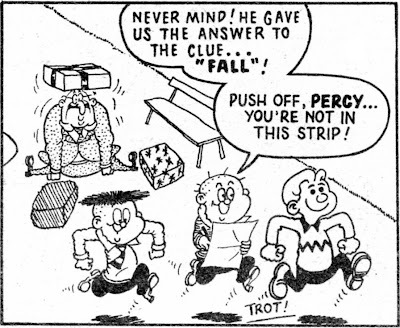 The strip at the top of the page is scanned from an A3 hand-coloured photocopy, hence the wrinkles and wavy border lines in places. 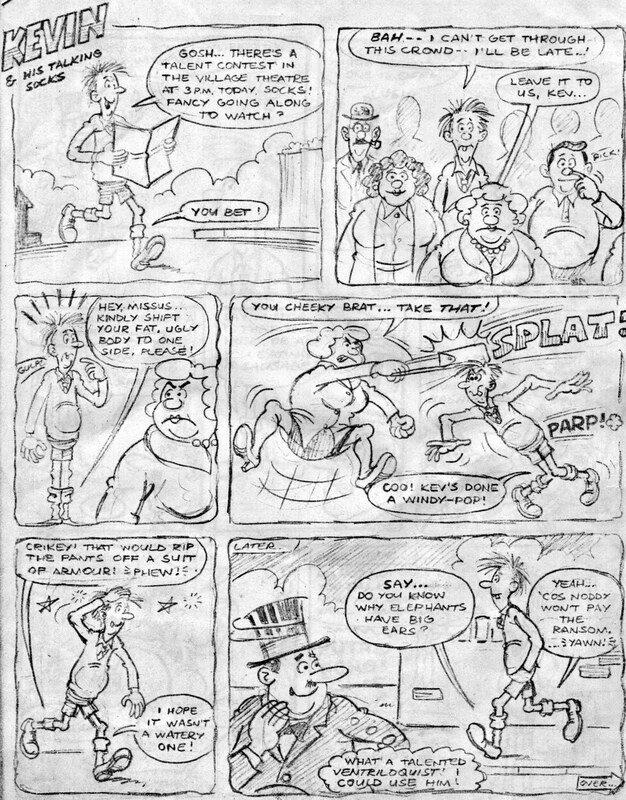 It was produced in a hurry for The ILLUSTRATED COMIC JOURNAL about fifteen years ago - see footnote under the strip for details. At the risk of overkill, here it is again, in its original, one-page format. Created, written, pencilled, inked and lettered by myself. Nice of me to take the blame, don'tcha think? Unfortunately, due to Lew Stringer maliciously implying on another forum that this post contradicts my claim to never having actively sought a career as a strip cartoonist during my lettering years, it behooves me to emphasize some important points. 1) Bob Paynter sought my participation, not the other way around. 2) Responding to an invitation for ideas is not pursuing an ambition. 3) Had the idea been accepted (instead of just copied), I would've been unavailable to draw the strip. My 'involvement' would've ended upon acceptance. Hopefully that clears things up. 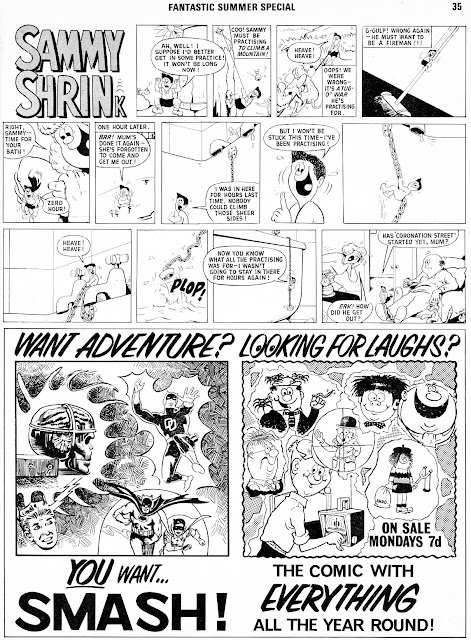 Although at one time I did entertain aspirations to become an adventure comic strip artist, I swiftly abandoned them once my freelance lettering career took off. I never actively sought any kind of regular or long-term work as an artist on any comic during my fifteen year stint in the industry. Further details are covered in passing on this post. No doubt a certain 'someone' will try to manufacture a discrepancy, but everything I have ever said on the subject is consistent under scrutiny with the application of a little contemplative consideration. 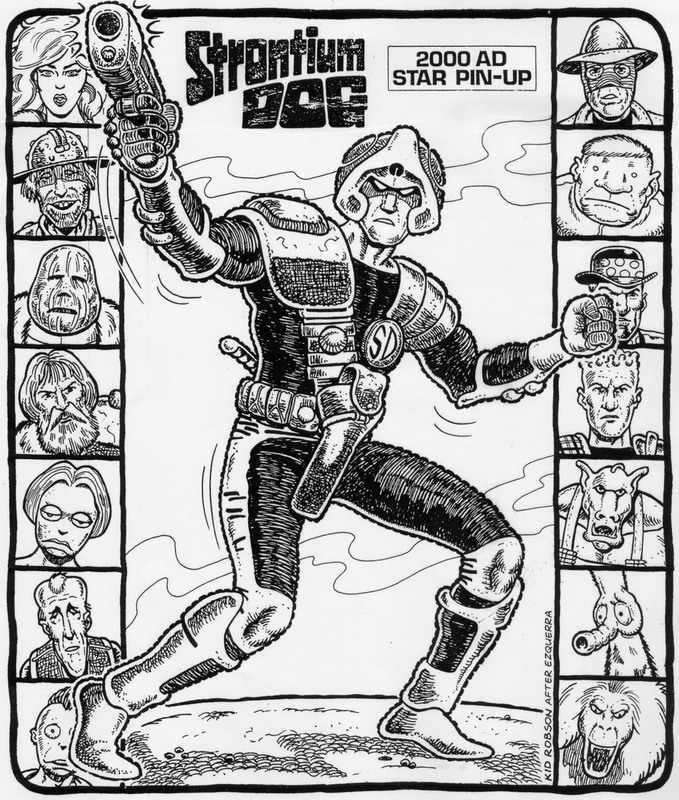 Nearly 25 years ago, as the lettering artist of 2000 A.D.'s STRONTIUM DOG, I decided to have a go - purely for my own amusement - at drawing ol' JOHNNY ALPHA in the style of the strip's artist and co-creator, CARLOS EZQUERRA. However, I don't know if it was ever published - so here it is, perhaps for the very first time anywhere. Remember, it was drawn a long time ago, so please be gentle. 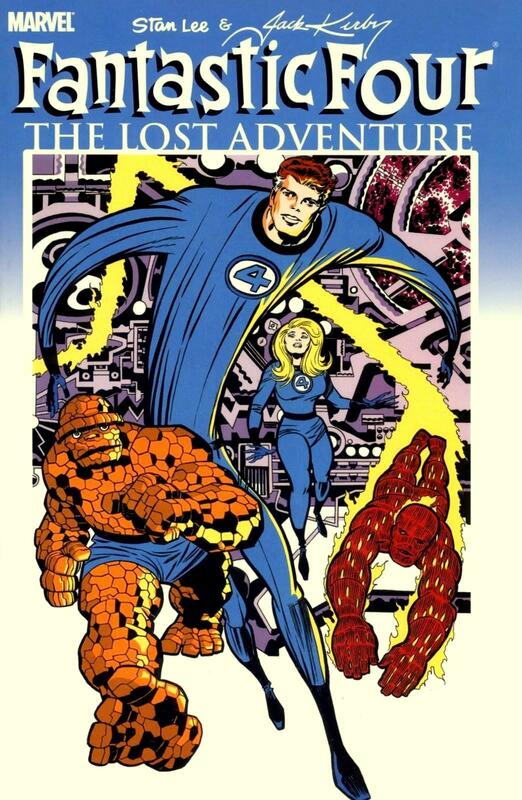 When MARVEL announced the release of FANTASTIC FOUR - The LOST ADVENTURE a couple of years back, I was quite excited. 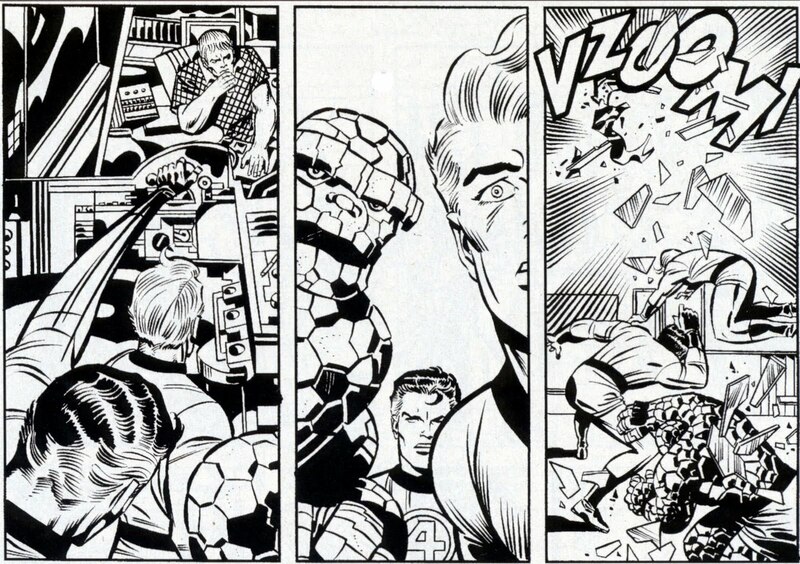 After all, how could it be anything other than interesting to see what the legendary JACK KIRBY had originally intended for this tale before STAN LEE revised it into a flashback, bookended by new JOHN BUSCEMA artwork? And it was interesting - but it certainly wasn't the blockbusting, overwhelming experience we were all led to expect. 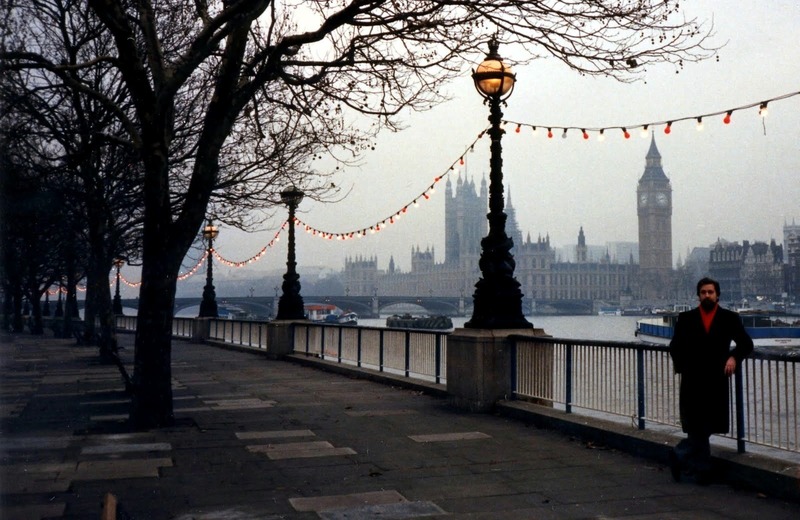 JOHN MORROW, in his introduction, says that Stan and John's version was "a real mess that, quite frankly, didn't make much sense". I disagree - if anything, it was Jack's version that was somewhat lacking in that department. It's no secret that Jack wasn't trying too hard in his last few months at Marvel, and was content to produce entertaining, but less than earth-shattering, one-off, basic stories as he marked time 'til moving to DC COMICS. The coincidence of a bust of JANUS being unearthed at almost the same time the FF battle a villain of the same name is a tad too contrived. Stan could no doubt have diluted this aspect with a bit of clever dialogue, but instead of running with a one-off tale, he made better use of the character and used the story as a prologue to a two-part adventure in the Negative Zone. Also, by editing out the twin that Jack introduced, Stan's clever twist in the tale of the 'brother' being the evil manifestation of Janus himself is more in keeping with the 'two-faced' aspect of the name, and resulted in a far more satisfying resolution to the episode. 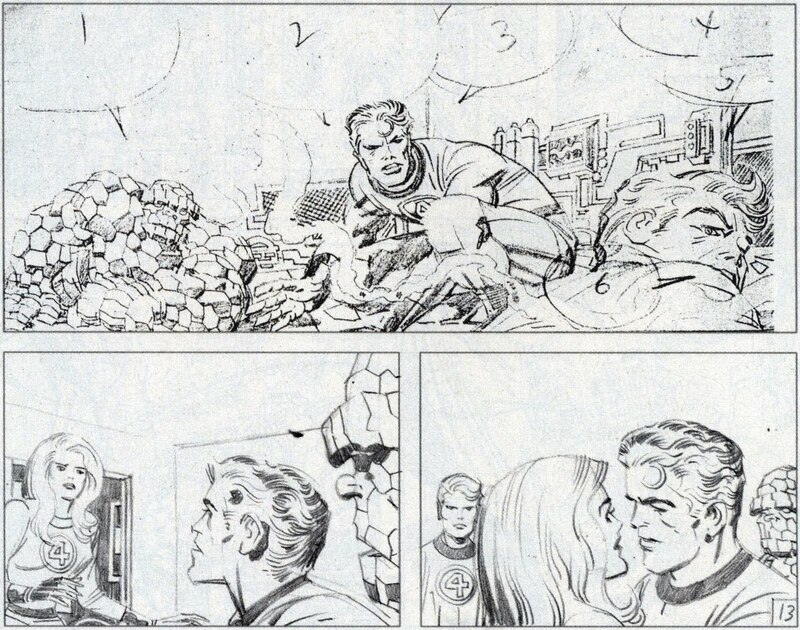 Sure, it would've been nice if Jack had drawn the complete issue, but Big John B's input isn't too distracting, thanks to Joltin' JOE SINNOTT's inks. Jack's story wasn't bad - but Stan's version had more depth, more characterization, more drama, more conflict - and, ultimately, far more entertainment value - not to mention being much more satisfying. At least, that's how I see it, but I suppose it's really rather subjective as to which presentation is better. In the final analysis, the most that can be accurately - and objectively - claimed is that the two versions are merely 'different' - and only slightly at that. Stan and Jack might not always have agreed on which direction a story should go, but neither of them ever produced a "mess" in their lives. In Volume 11 of FF MARVEL MASTERWORKS, JON B. COOKE suggests in his introduction that Stan's decision to delay the story may have been due to "spite from a hurt ex-partner". I confess that I was surprised by this comment - and even more surprised that Marvel printed it. To introduce this unfounded and unwarranted speculation from out of nowhere is recklessy irresponsible. In what way would the printing sequence of a one-off story have affected Jack - by then an ex-contributor? The idea is ludicrous and clearly without merit; there is no evidence to suggest that Stan's decision to delay the story is attributable to anything other than taking the time required, as editor, to work on what he saw as problems with the plot. 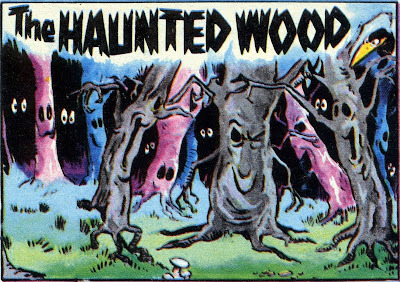 One can never be dogmatic in speculating how history may have been altered had certain aspects been different, but it's not entirely unlikely that, had Jack never left Marvel, the story may well have seen print more-or-less exactly as it appeared with Stan's revisions - but illustrated by Jack from cover to cover. 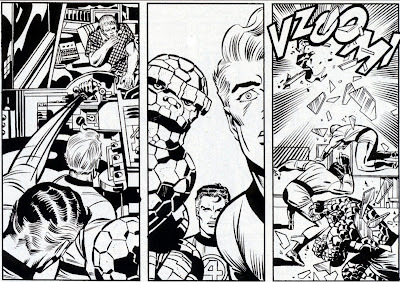 After all, Stan often asked Jack to redraw panels and pages to accommodate his ideas for the direction of the plot, so there's no reason to suppose that it would have been different on this occasion. Therefore, perhaps the only difference Jack's departure made to the finished result, was that the revisions were rendered by John Buscema instead of Jack himself. However, there are other issues raised by this landmark story. To read what they are, click on this link. A couple of years or so back, I purchased The BIG BUMPER BOOK Of LOOK & LEARN (published by CENTURY). 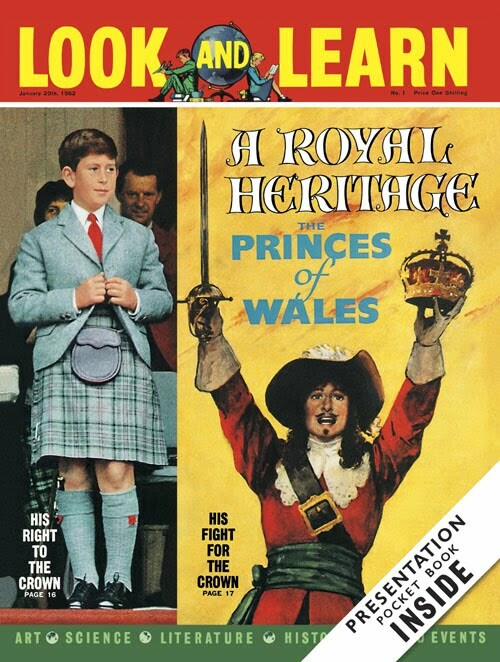 I didn't buy the mag when I was a child (though I did for a time in the mid-'70s as a teenager), but its presence was everywhere; schools, libraries, doctors' and dentists' waiting rooms and the like, and it was certainly a quality magazine. As well as the book, a new series of LOOK & LEARN was also published as a limited, 48 issue subscription, with binders also available. Recently, I bought the set - and what a treasure it is! Many of the paintings are truly astounding, being by the likes of top illustrators of the day - like EMBLETON, LAWRENCE, HOWAT, PAYNE, etc. What's more, although it originally appeared in RANGER magazine, the legendary TRIGAN EMPIRE is reprinted from its first episode - as it originally appeared. On top of all that, if you purchase the set, it comes with a faithful facsimile of the original 1962 issue of Look & Learn #1 - complete with free gift. Go on - recapture those long-ago, vanished days of your youth, and order the set - with binders - of a true classic that graced the news- agents' shelves for a good 20 years. You know it makes sense. Details can be found at http://www.lookandlearn.com/ - click on now. 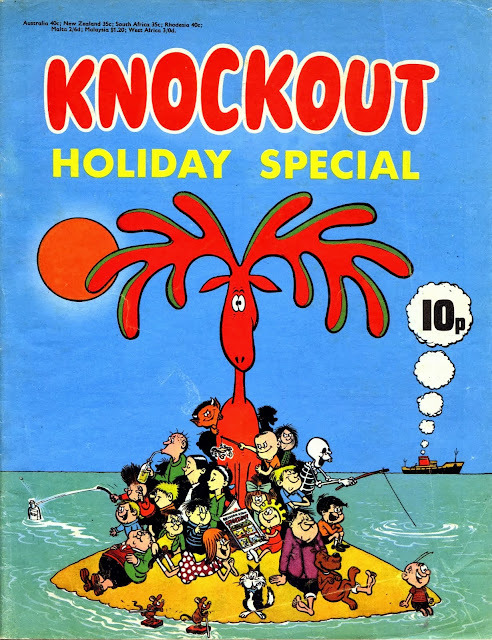 One of my favourite comics of the '70s was KNOCKOUT. I faithfully purchased it every week, and I recall being particularly fascinated by the cover of the 1972 HOLIDAY SPECIAL. There was just something about the colours that captured my attention. 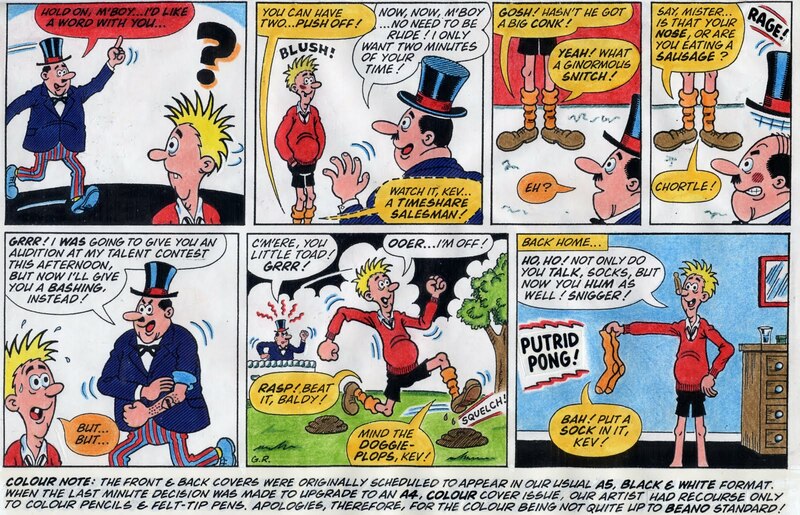 The Special featured such strips as My BRUVVER, PETE'S POCKETS, SHRIMP, BEEFY BRAWN, SON Of SIR, COPY KATE, JOKER, The TOFFS & The TUFFS, The GROUP, MOOSE, BEAT Your NEIGHBOUR, BARRY & BOING, The SUPER SEVEN, BONEY, FUSS POT, LITTLE DEVIL, The FULL HOUSE - and my favourite - The HAUNTED WOOD. Super value for money at only 10 new pence. 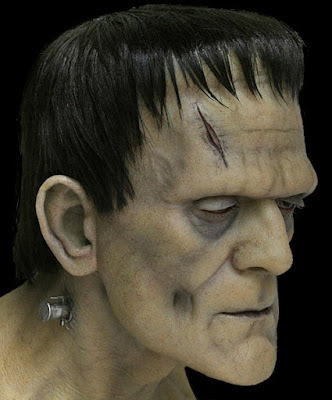 Regarding the image below, I originally drew the face freehand (using a photo as reference) back in around 1981/82. In 1985 I was contributing to HUGH CAMPBELL's fanzine, FUSION, and I decided to knock up a cover for it. I hand-lettered the logo, added some Letratone, drew the shoulders, then cut out a photocopy of my drawing of the head and stuck it down. (I wasn't drawing all that again.) The above scan comes from a poor photocopy of the original finished cover. 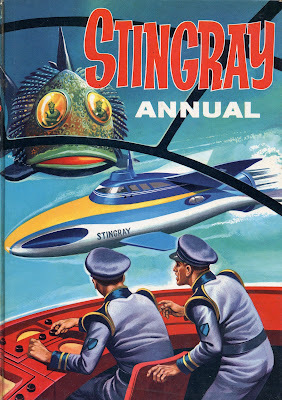 STINGRAY ANNUAL, painted by RON EMBLETON. verbiage from me - art like this speaks for itself. "I WISH I WAS A SPACEMAN..."
MIKE NOBLE still illustrates today as well as he ever did. 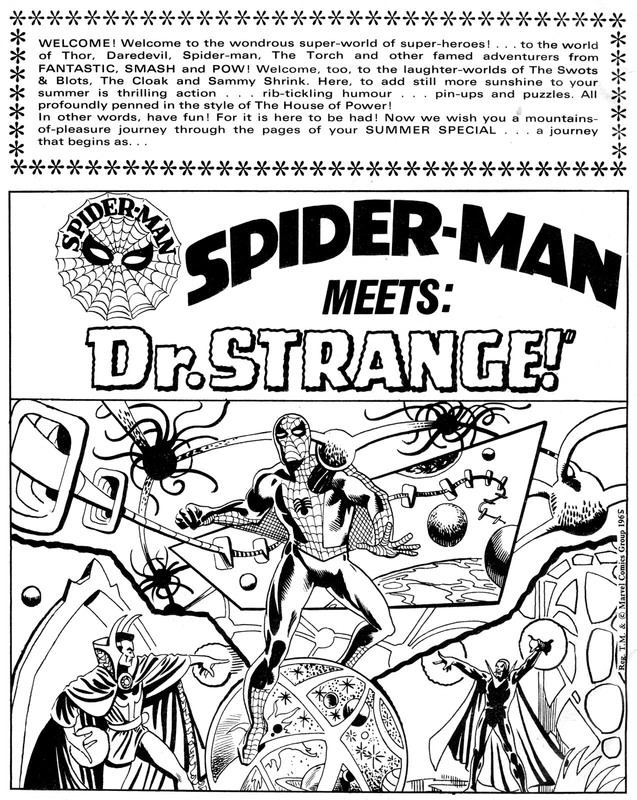 Age took its toll on the talents of KIRBY and DITKO, but you'd be hard-pushed to find any deterioration between the quality of what he produced week after week in the pages of TV COMIC, TV CENTURY 21 and LOOK-IN (and many other titles) back in the '60s, '70s and '80s, and the occasional commissions he undertakes today. It's said that a picture is worth a thousand words - here's two pictures which prove that little adage a thousand times over. 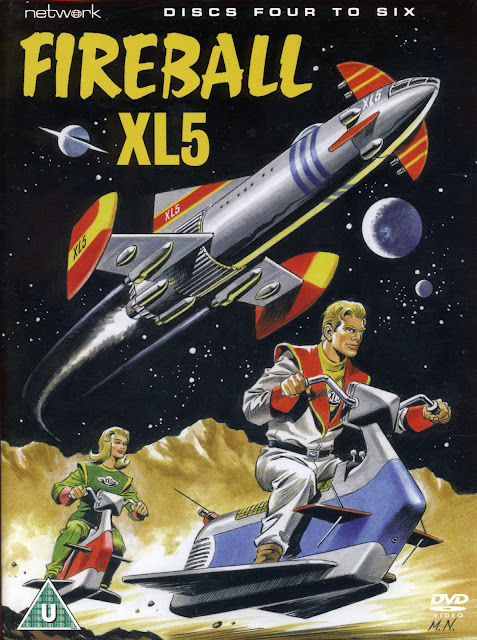 Above, the cover of the 1966/'67 FIREBALL XL5 Annual; below, the cover to one of the disc holders in the complete DVD collection of the same programme. MEEEEEEOOOOOOOOOOWWW!!!! 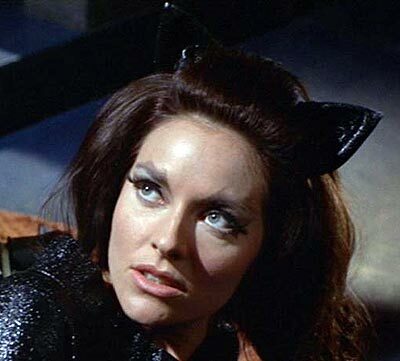 LEE MERIWETHER - THE CAT'S PYJAMAS! You want words too? Are you mental? Just look at that face. 'Nuff said! Study that cover - doesn't SUPERMAN look as if he's actually hovering in mid-flight outside CLARK KENT's highrise apartment? You really do believe a man can fly! 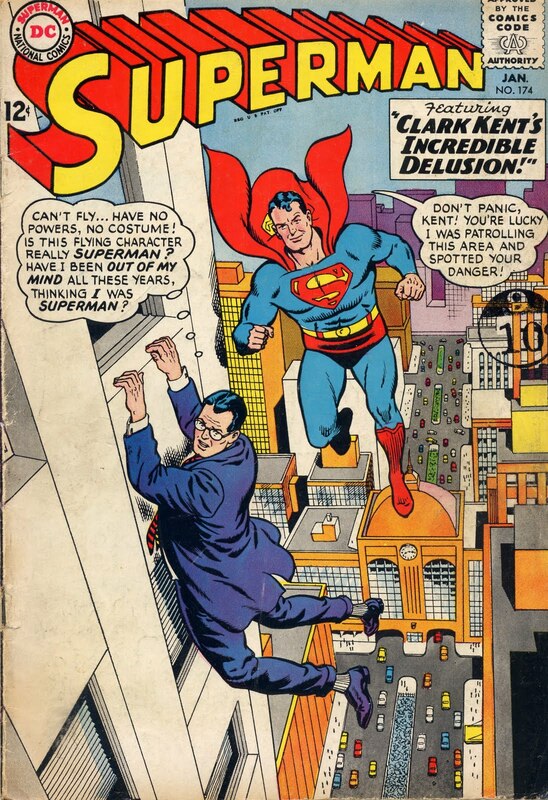 Doesn't Clark look like he's really clinging on for dear life to avoid falling to his doom? Artists like ALEX ROSS have accustomed us to realistic depictions of superheroes - but, back in the '60s - CURT SWAN had been there, done that, and bought the celebration mug - at a time when comicbooks were regarded as kid-stuff and as far removed from realistic illustration as could be. The cover has an almost 3D quality to it, and when I look at it, I wonder why, back in the early '80s, many then-current "new kids on the block" artists described Curt Swan's work as "boring". I don't think it was boring - he just had an uncanny knack for making fantastic events look as if he'd glanced out of his window and recorded them on artboard as they happened. The word I'm looking for is - real! 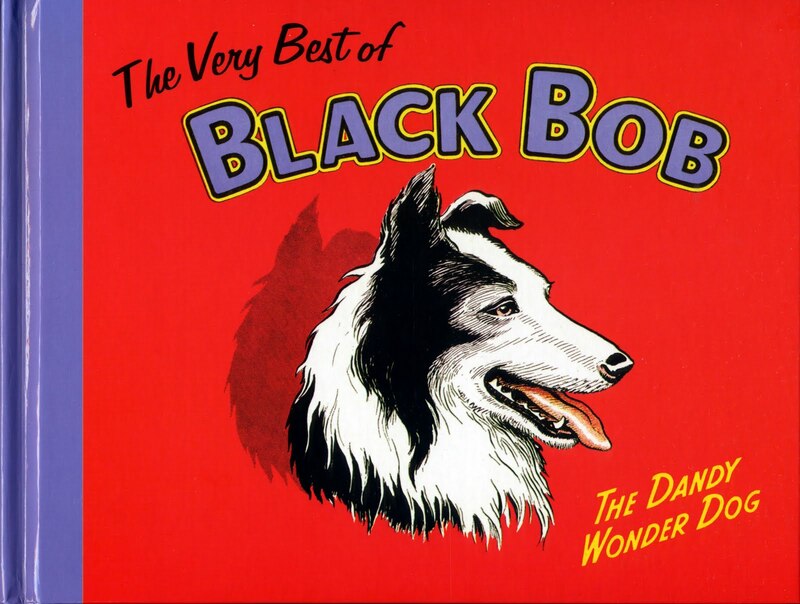 I remember this cover from my childhood, and the effect it had on me then. It still has that effect today. That takes a special kind of talent - and talent was what Curt Swan had in spades! 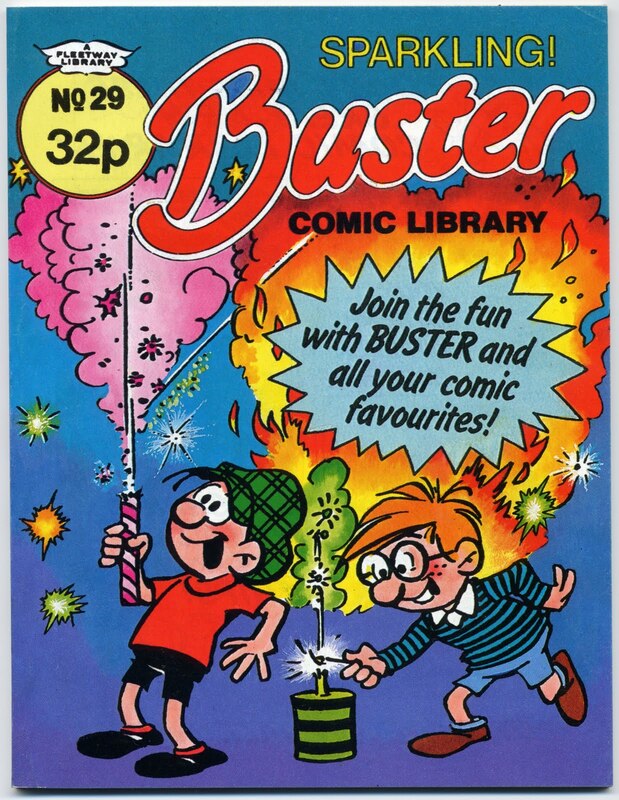 Look at the pic above - my part of it was drawn about 25 years ago when I worked as a resize artist on the BUSTER and WHIZZER & CHIPS comic libraries. That entailed turning one standard-sized page into two 'commando' sized pages. I won't bore you all with the reasons why here. Anyone interested can skip over the excellent BUSTER site at http://www.bustercomic.co.uk/ and read a fuller account on the interviews page. However, part of the process often involved extending the odd panel or two. 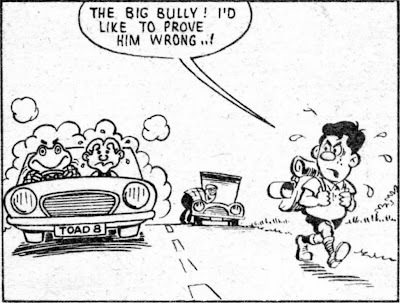 I could've merely extended the horizon lines to fill out the pic, but I thought I'd give the editor value for money, hence the addition of Mr. TOAD and my own character, PERCY PROON, on the left-hand side of the picture. I was always quite proud of the effort I put into the comic libraries, and I remember working on this panel as if it were yesterday. So, just thought I'd post it here. Bear in mind that a comic libraries page (before printing) was only about twice the size of the published item, so I had to draw pretty small. Yup, ol' Percy sure got around in those days. Some years back, I saw some collectable toys advertised in EXCHANGE & MART. I duly sent off a cheque for the required amount and sat back to await my treasures - they never came. I contacted the seller, and it was clear from his evasiveness that he'd never had the items to begin with. 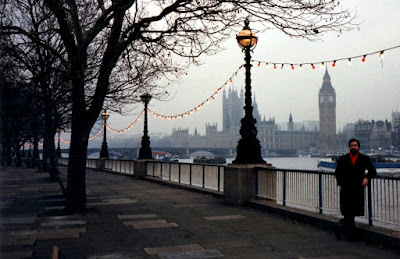 Being Scottish, I'll travel miles to recover a shilling, so London was no distance. Faster than you can say 'speeding bullet', I was down there to recover my money from said shady seller and to inform him of the error of his ways. Did I recover my money? Is SALMA HAYEK a goddess? Of course I did! And what did the would-be conman get from the encounter? I'll leave that up to your imagination - but he wouldn't have been smiling for a while. One up for the good guys I'd say. With an introduction by Morris Heggie, and an index by Ray Moore of every Black Bob tale ever published. Superb value at only £9.99. Calling all SUPERCAR fans! 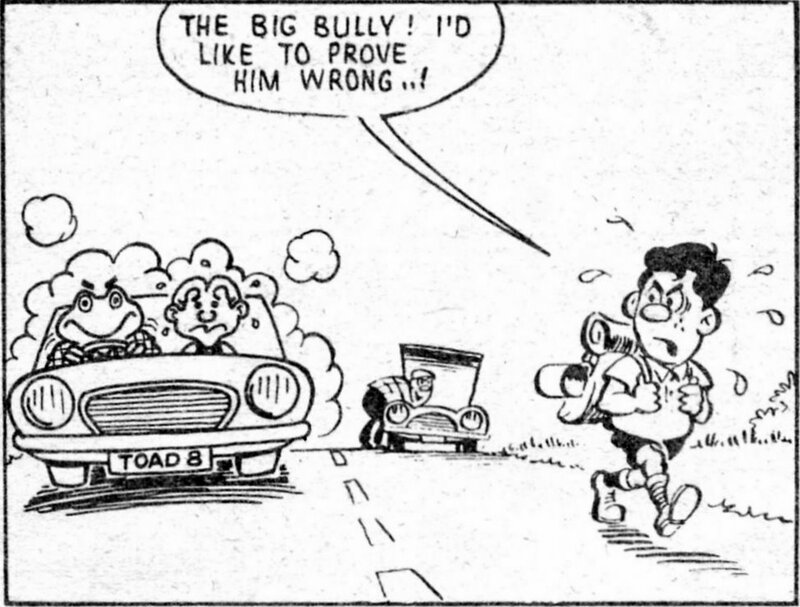 Back in the '60s, GOLD KEY published four Supercar comics. Last year, artist Evi De Vie re-created the cover of issue #2 as a limited-edition print, which I suspect are long gone. However, he recently signed fifty 16 x 20 proofs - so check out the following link for details of how to obtain one. Better be quick! FULL BOOST VERTICAL! Gold Key's Supercar comic from the 1960's featured beautiful painted covers featuring the Black Rock labs crew in adventurous or dangerous settings. Evi De Vie is an American illustrator, and one of the original designers for the Lunar Models. Lunar Models was the original American sci-fi garage kit company and De Vie worked on many of the company's models. He has been a fan of the Anderson's Supermarionation and live-action shows since childhood. 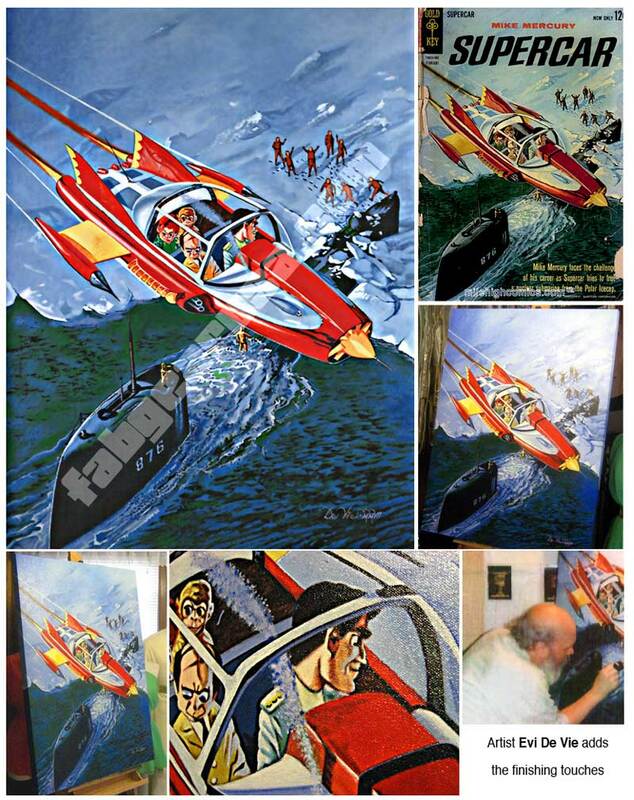 This unique reproduction is the result of many painstaking hours of work and the result is stunning. Supercar majestically passes above the ice floe as the men below wave. In the cockpit, Mike, Professor Popkiss, Jimmy and Mitch look down at the scene. 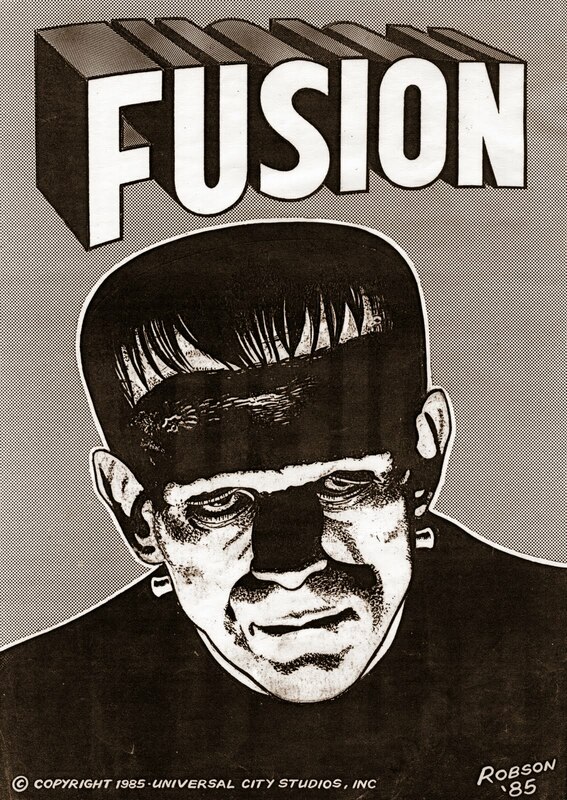 Evocative of the best comic art of the 1960's, this print is a must-have item any Anderson collection. In case you were wondering, ol' SPIDEY's web is attached to an over-head helicopter - unfortunately however, he's been hanging on since Glasgow and he's now over Blackpool, so his arms are tired. What a great cover though, I'm sure you'll agree. 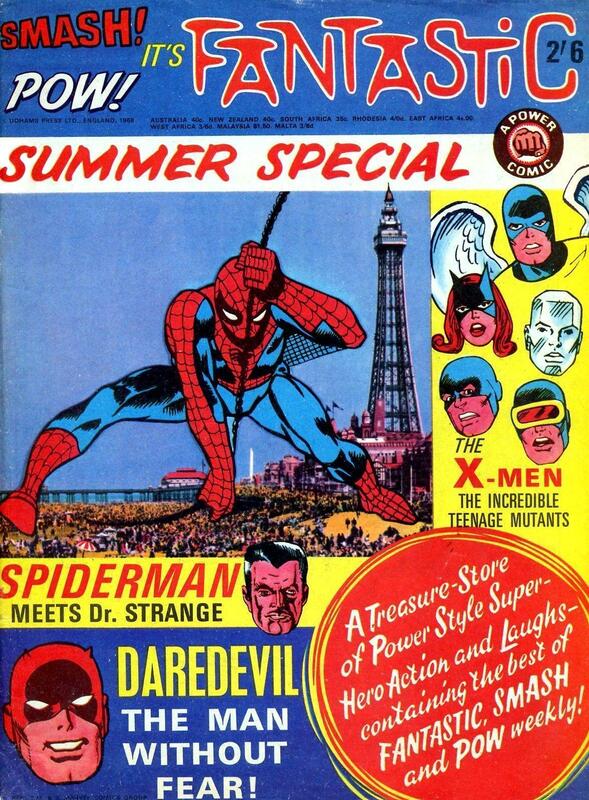 This was a cracker of a Summer Special, featuring SPIDER-MAN MEETS Dr. STRANGE, the origin of DAREDEVIL (abridged), The TORCH MEETS The ICEMAN, The CLOAK BATTLES The CRAFTY CROW, Mr. KNOWALL'S FUN PAGE, The SWOTS & The BLOTS, THOR vs HERCULES: WHEN TITANS CLASH!, SAMMY SHRINK, BRIAN'S BRAIN, full-colour pin-ups, plus a few other things I've doubtless forgotten. I only have to look at this and I'm back in 1968. Ah, happy days. Unfortunately, though I little knew it at the time, the POWER era was coming to an end. A mere three or four months later, FANTASTIC was incorporated into SMASH!, which itself only lasted in its then-present form for another four or five months - before being relaunched in March '69 as a more traditional type comic in the VALIANT vein. 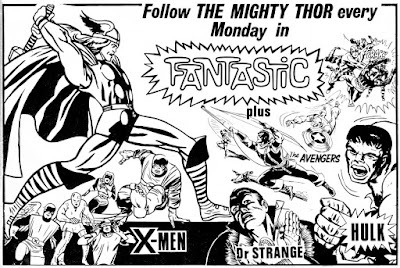 That meant no more weekly MARVEL heroes (not counting TV21's dabbling with a few of them) until The MIGHTY WORLD Of MARVEL was launched on the very last day of September, 1972. 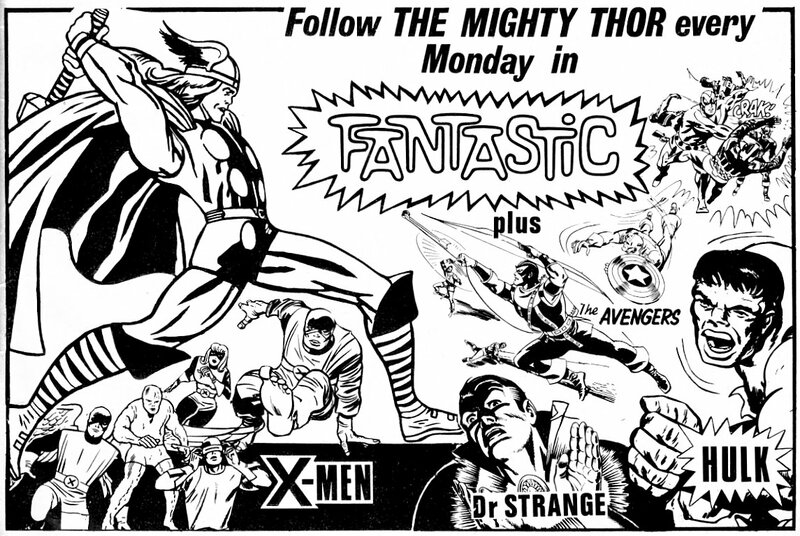 Anyway, enjoy these awesome images from the only ODHAMS PRESS Summer Special ever to feature the sensational superheroes from the Mighty Marvel stable. It's a genuine collectors' item. 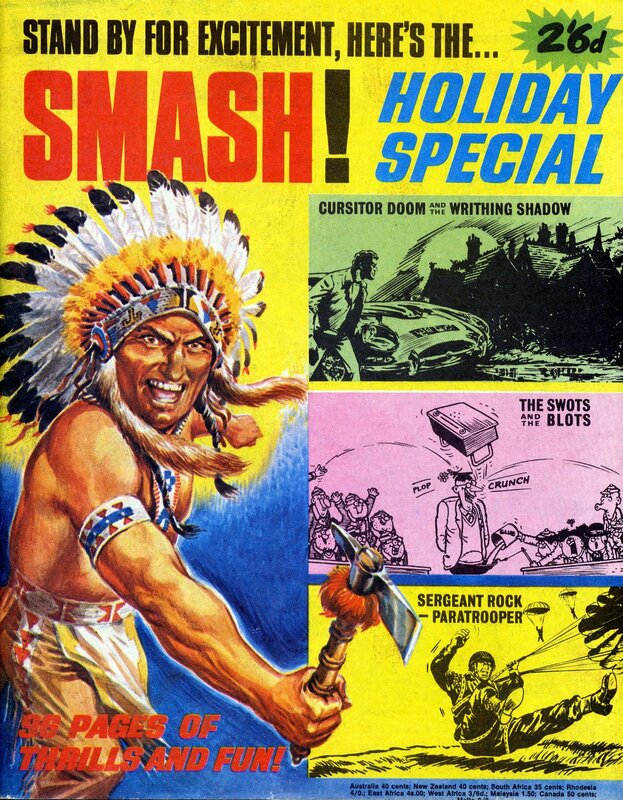 Just for fun, I thought readers might like to see the cover and some interior panels from the 1969 SMASH HOLIDAY SPECIAL. Although I was disappointed when SMASH! 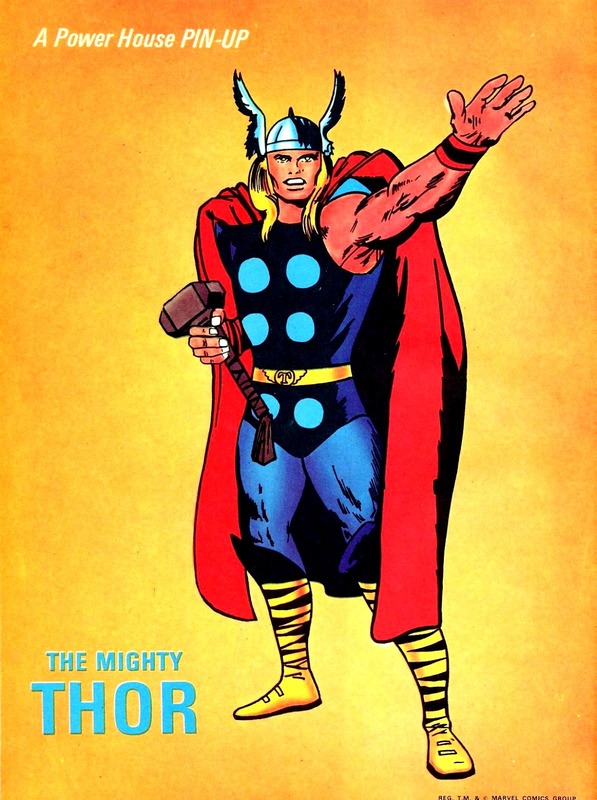 stopped featuring MARVEL reprints, I have to admit that I liked the relaunched version almost as much. A few years ago, GIL PAGE, who was the editor of the new SMASH!, wrote an article at my request about his life in comics. 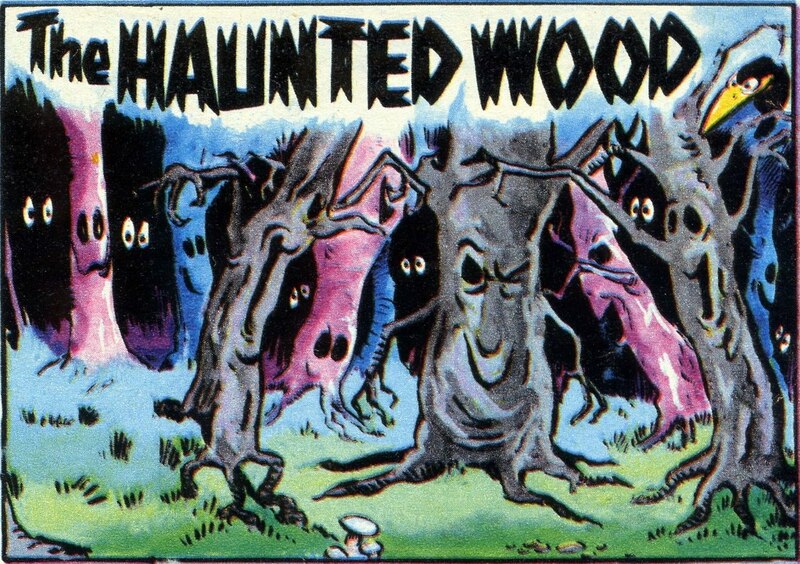 It was intended for publication in The ILLUSTRATED COMIC JOURNAL, of which I was assistant editor, but the magazine changed hands and then faded into obscurity without the article ever seeing print. Fortunately, CRIKEY! stepped into the breach and published the article in issue #5. So, for an interesting read about the background of SMASH! 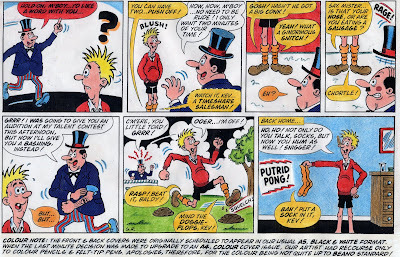 (and other fascinating, never-before revealed reminiscences by Gil - who went on to become the executive editor of the FLEETWAY/ IPC comics division), track down a back issue of CRIKEY! #5 as soon as possible. Life's not complete without it. Back in the 20th century - 1973 to be exact - an envelope addressed to myself popped through the letterbox one morning. Being only 14 or so, receiving personal mail wasn't a regular occurrence for me, so naturally enough I wondered what it was. 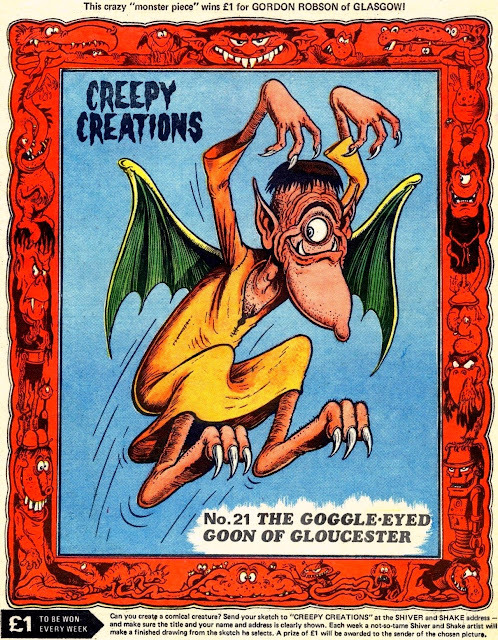 I soon found out - a postal order for £1, along with a cover-note telling me that my "Creepy Creation" would be featured in the very next issue of SHIVER & SHAKE. When the day arrived, I rushed out and bought a copy. 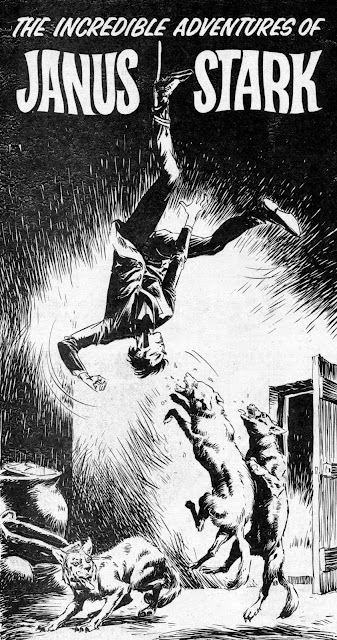 Nevertheless, thrilled as I was about my moment of fame (to say nothing of my untold wealth), I was surprised to see that it seemed to be my actual drawing that had been printed - albeit with a super-duper, touch-up inking job by the mighty KEN REID. I'd hoped that my original drawing would be good enough to be published as is, but I was resigned to the likelihood that it would be completely redrawn by Mr. Reid himself. But no - all the glaring imperfections of my original art were still all-too obvious - surely Ken would've fixed them if he'd completely redrawn my submission from scratch? 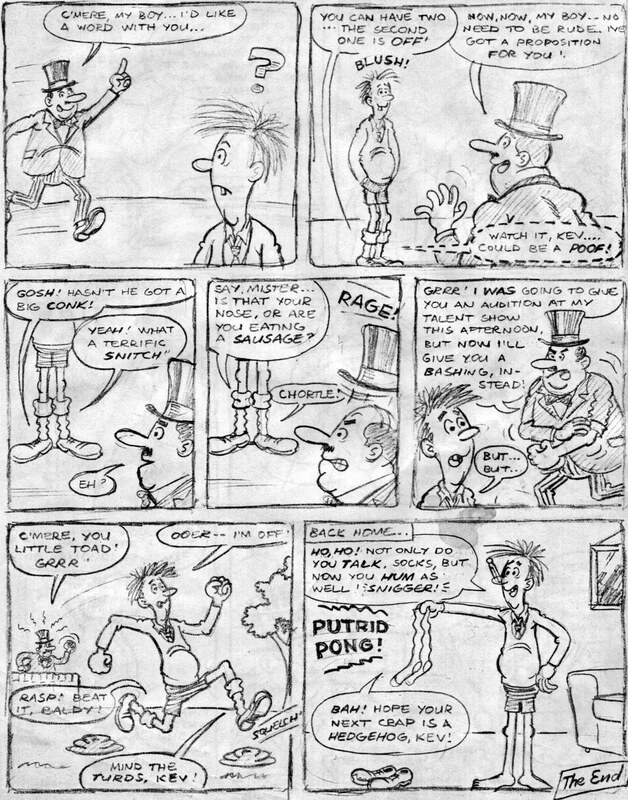 Honest - that really appears to be my basic drawing under the super-slick inking style of the artist of FRANKIE STEIN and FACEACHE and loads of other characters. The wings are a bit more ornate than I would've rendered them, but what you're looking at is a genuine Robson/Reid collaboration. Ken wasn't the only one to recognize quality when he saw it, though. (Relax - my tongue is half in my cheek.) A few years later, someone traced my character and submitted it to a competition in one of MARVEL's U.K. weeklies (I think) - and was one of a 100 runners-up. To add insult to injury, I'd also entered the competition and was amongst the top ten of those 100 runners-up, but my prize of a Treasury Edition must have been lost in the Twilight Zone because I never received it. You all know the story. Or at least, you should - it's been repeated often enough. Once upon a time, there was a comic called AMAZING FANTASY. From issue #7 it was rechristened AMAZING ADULT FANTASY, but it reverted back to its original title on its 15th and final appearance. And in that last issue was a 'throwaway' character called SPIDER-MAN, in an 11-page origin tale. Publisher MARTIN GOODMAN had reluctantly allowed writer/editor STAN LEE to get the character out of his system, because it didn't much matter what the contents were of a magazine whose demise had been ordained months before due to declining circulation. When that issue's sales figures came in, it was realized that Spidey was a surprise hit, and he was resurrected in his own comic. Yep, that's the story, which has now passed into legend. 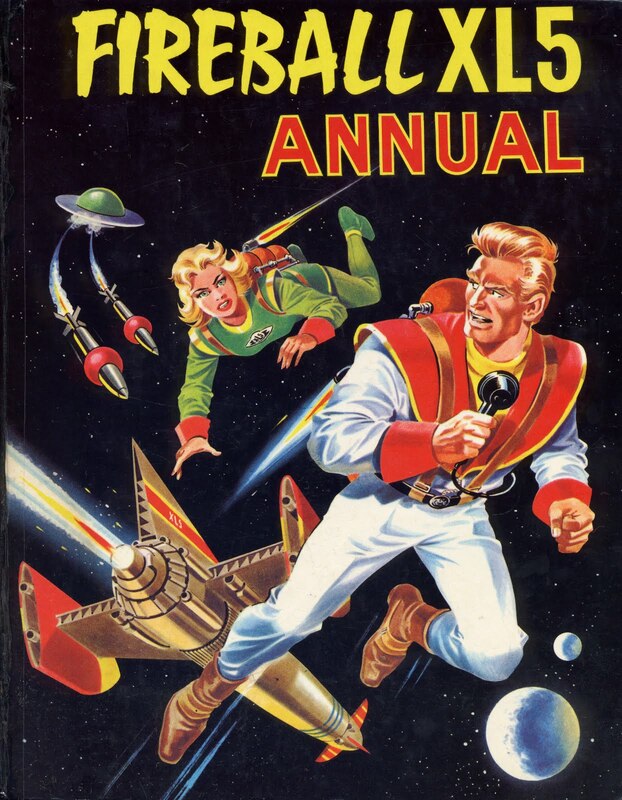 So what's wrong with it - apart from the fact that the first six issues of Amazing Fantasy were actually called AMAZING ADVENTURES? Almost everything, as it happens; it's not a legend - it's more of a myth! The proof of this assertion? 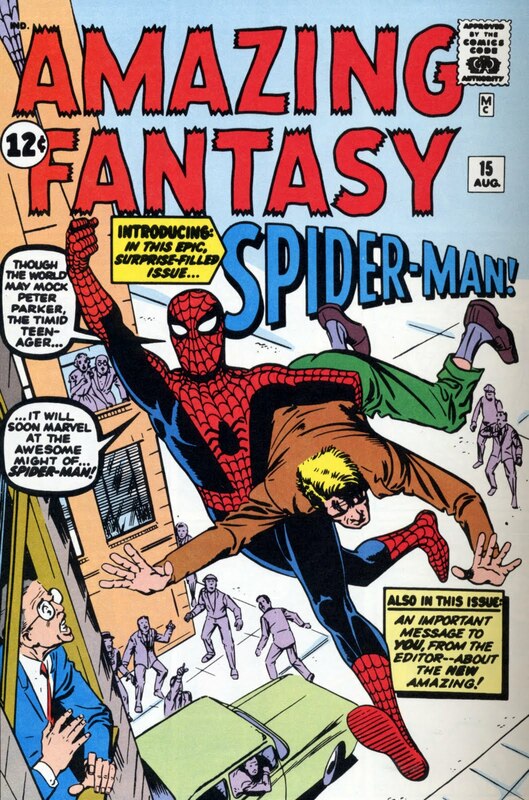 Amazing Fantasy #15 itself! Read the final caption (deleted from most reprints until recently) of Spider-Man's origin. "Be sure to see the next issue of Amazing Fantasy - - - for the further amazing exploits of America's most different teenage idol - - Spiderman!" Not yet convinced? Read the "important message" (proclaims the cover blurb) "from the editor" inside the magazine for the clincher. 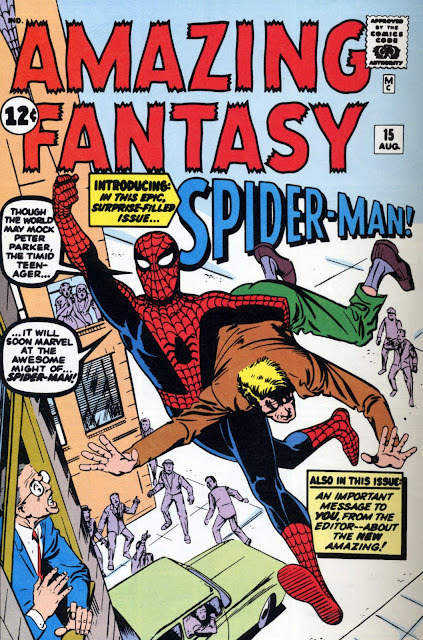 "As you can see, we are introducing one of the most unusual fantasy characters of all time - The Spiderman, who will appear every month in Amazing. 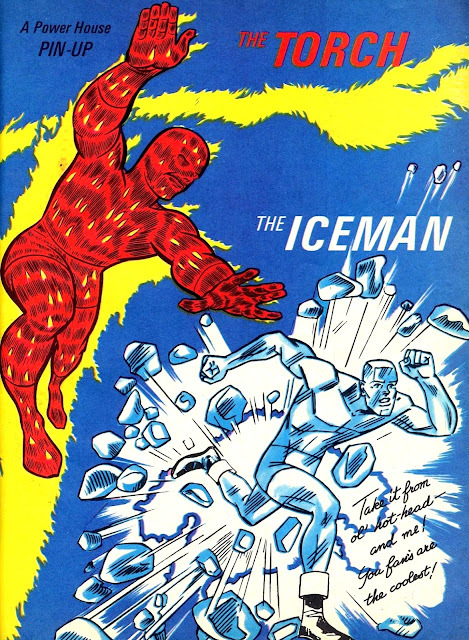 Perhaps, if your letters request it, we will make his stories even longer, or have TWO Spiderman stories per issue." The lettering in the final caption has clearly been altered from Amazing Adult Fantasy to Amazing Fantasy, indicating that not only was the name-change a last minute revision, but also that the decision to cancel the magazine wasn't made until after it had gone to press and maybe even hit the stands. Final confirmation is supplied by the new logo - why go to the bother and expense of designing a new masthead for a mag you knew was going to be the last issue? The word "adult'" could easily have been omitted from the old logo with no extra work required. It's fairly obvious what happened. 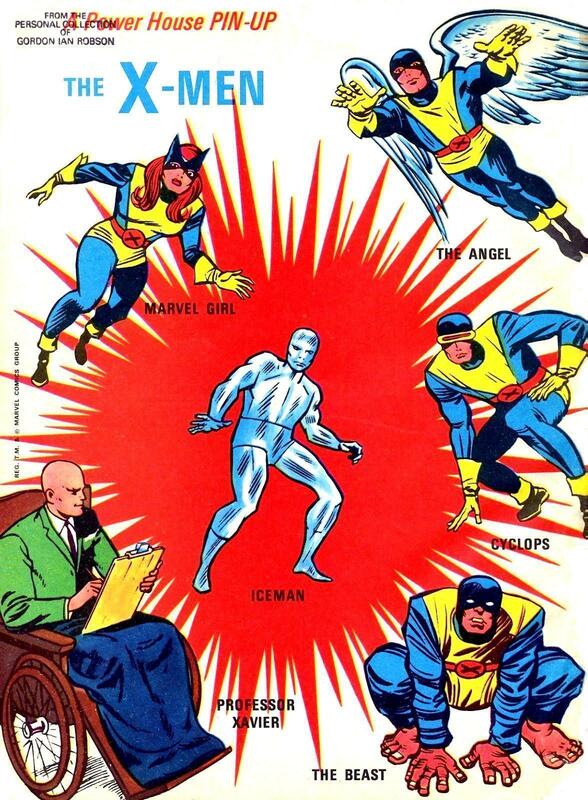 Goodman must have become aware of just how poorly previous issues had performed and wielded the axe, regardless of Stan's plans for the title. Then, months later, when the higher-than-usual sales figures and positive feedback from readers came in, Goodman gave permission for Stan to continue on course. 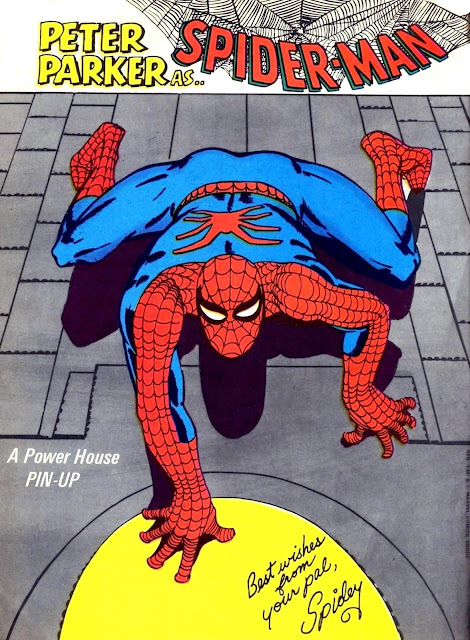 Besides, a big, bold AMAZING SPIDER-MAN logo screaming from the cover of his own mag would have more impact on the spinner-racks and greater appeal to readers wanting in on the ground floor. 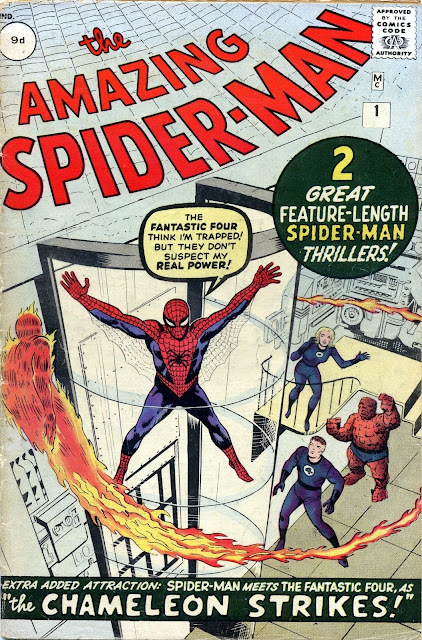 At that time, a restrictive distribution deal meant Marvel could only produce around eight titles a month, so what had been intended as AF #16 metamorphosed into The AMAZING SPIDER-MAN #1, with a potentially sales-boosting assist from The FANTASTIC FOUR on the cover. (The main story was no doubt prepared for AF #16. 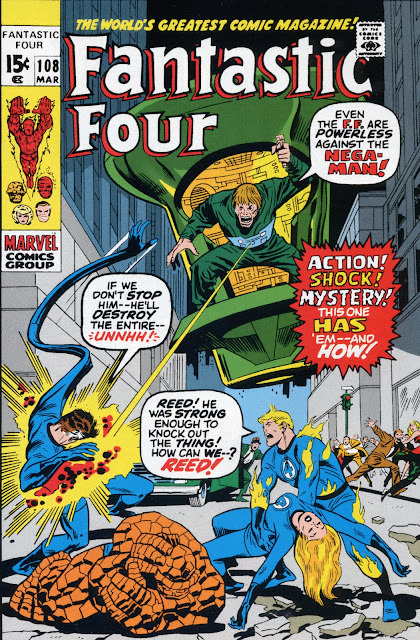 The cover-featured back-up story - and therefore the cover itself - were probably later developments to hook FF readers in a cunningly conceived sales ploy.) 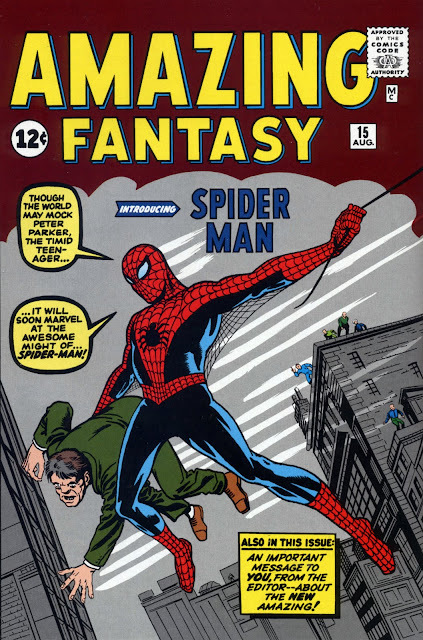 It's clear, however, that Spidey's own title was, in content if not in name, exactly what Amazing Fantasy was intended to become. 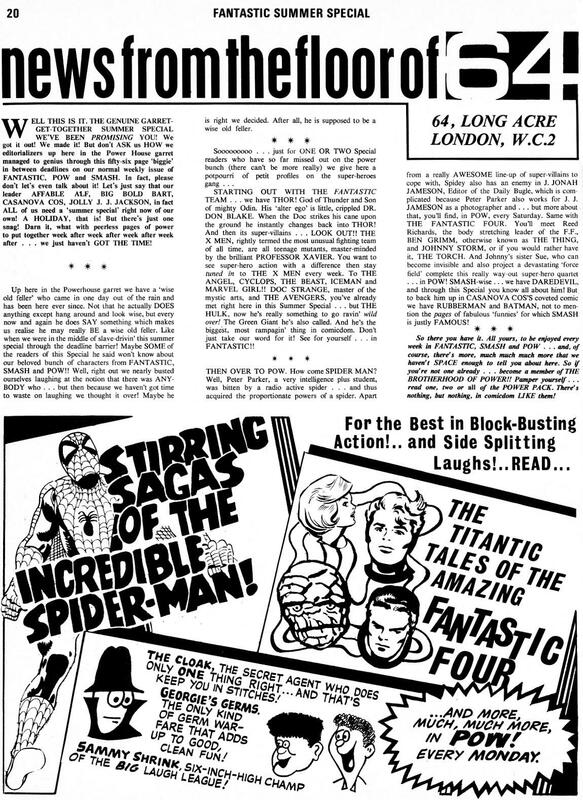 So why, in the letters page of ASM #4, did Stan Lee give the following account of how Spidey gained his own title? "We planned to present him in the final issue of AMAZING ADULT FANTASY, just to satisfy ourselves. But, the rest is history! His surprise appearance jolted readers everywhere, and we were deluged with letters demanding that he be given his own magazine." One explanation is that perhaps he simply meant "We planned to present him in [what became] the final issue..."
Or, given Stan's notoriously poor memory and the seven month gap between AF #15 and ASM # 1, he probably just forgot the precise details. 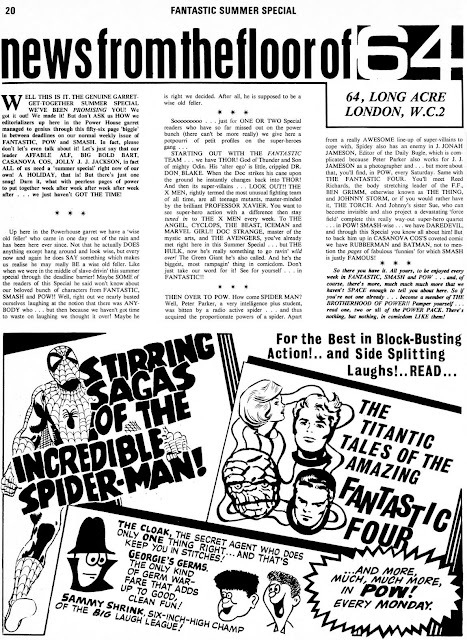 Years later, when he came to write ORIGINS Of MARVEL COMICS, he simply recounted the story as he (mis-)remembered it from ASM #4, even 'though it didn't quite match up with the facts presented in AF #15 itself. There! 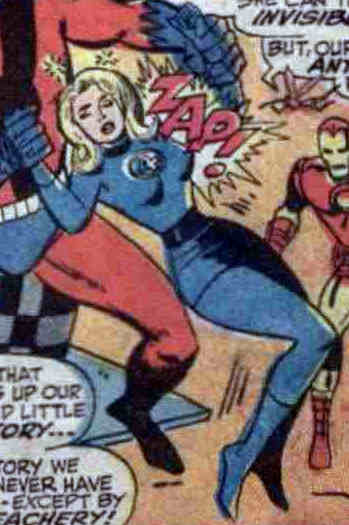 Another Marvel Mystery cleared up for posterity. If only it was always so easy! CAN ANYONE KINDLY EXPLAIN THIS MYSTERY TO ME?